Click on photograph to enlarge it. his most important commission was the architectural sculpture scheme for Imperial Chemicals House, Millbank, architect Sir Frank Baines. (The large figure sculptures representing four industries on the fifth floor are by Charles Sargeant Jagger.) The ground floor entrance is Fagan's most visible contribution and comprises massive bronze doors (modelled on the baptistery, Florence) surrounded by architectural carvings on a maritime theme cut in granite. 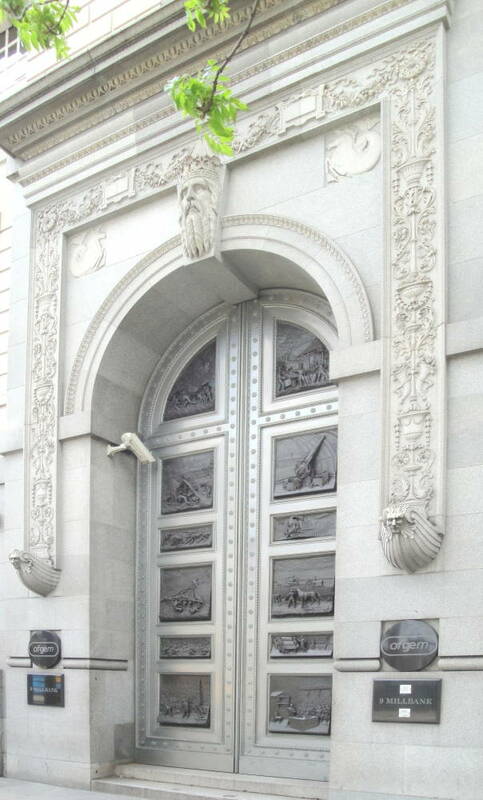 There are six relief panels on each door depicting advances in technology. The panels are paired with stone age technologies represented on the left contrasted with modern, industrial scenes on the right. The latter culminates (bottom right) with a scene showing the chemist, Michael Farraday lecturing to the Royal Institution. Fagan also completed the heads of scientists (primarily chemists) and industrialists on the keystones above the fourth floor windows which were commissioned in August 1927. These depict: Alfred Mond, Harry McGowan, Ludwig Mond, Alfred Nobel, Berthelet, Henry Cavendish, Antoine-Laurent de Lavoisier, Justus von Liebig, Dmitri Medeleyef and Joseph Priestley. “William Bateman Fagan.” Mapping the Practice and Profession of Sculpture in Britain and Ireland 1851-1951. University of Glasgow History of Art and HATII, online database 2011. Web. 1 June 2013.